We made a fruit rainbow, and every piece of fruit was eaten. I actually had to give C and R more fruit. What Makes a Rainbow? 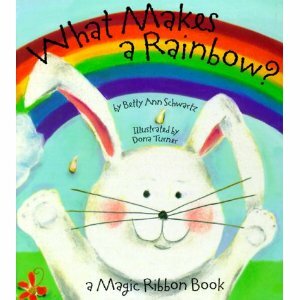 is helpful for teaching colors as a young rabbit goes on a quest to find out what makes a rainbow. Each color page features a ribbon of that color to make up the rainbow. My five year old still likes this book, mostly because of the ribbon rainbow. Oh cool whip clouds would be yummy! I'd be serving more fruit too if I served that. Oh, and my kids never put that book down when we go up to my in-laws. Love this...and love this book! ...And soon you get a chance to read this book with K :) I need to do a rainbow like this too!